Labour History, which has been appearing twice yearly since 1962, is the premier outlet for refereed, scholarly articles in the fields of social and labour history in Australasia. The interdisciplinary nature of labour history, and its acceptance of less traditional sources, including folklore and oral testimony, make it a fascinating field, alive to past and present social justice issues. 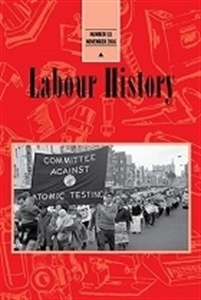 Labour History also publishes essays, reviews, and memoirs that reflect the involvement of labour historians in the making of history. It examines issues such as labour politics, trade unions, management labour practices, co-operatives, gender and ethnicity.